What models are you running? - Page 2 - Lake Houston Fishing! What models are you running? Post subject: Re: What models are you running? I have 2 Lowrance Elite 9 Ti and a Hook 5. I've been around SK, just not on Lake Houston much the past few years. 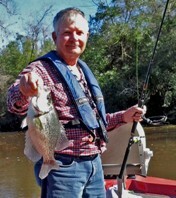 I think I saw you crappie fishing last time I was out, maybe early December. I have a new boat, no more Champion, got me a new red Ranger. I'm running a Lowrance HDS 12 Gen 3 on the dash with Structure Scan 3D.....and a first generation HDS 7 on the bow....I have the units networked.. Stumps and Lightning...... With a bit of planning and good judgment both can be avoided. Lowrance hds 7 gen 2 at the console with sidescan networked to a hds 7 gen 3 touch on the bow. Both have more features than I know how to use. Heck, I just learned that the gen 3 has a built in WiFi adapter. All I have to do is turn it on and connect to my Wi-Fi at home or turn my hot spot on my phone on and connect to it and it will automatically check for software updates and download them. It will also act as a WiFi access point and I can connect to it and get my logs downloaded wirelessly instead of shuttling the SD card around. I guess it would help to read the manual. GregG would you ask that thing what color jig the fish will hit today. It might even do that if you read a little farther in the manual. it seems to have a lot of good things it does.